Celebrate the 30th Anniversary of Francis Ford Coppola’s critically-acclaimed classic when Tucker: The Man and His Dream arrives on Blu-ray + Digital and Digital 4K Ultra HD for the first time ever August 28 from Lionsgate. Based on the life of maverick car designer Preston Tucker and his ill-fated challenge to the auto industry, the film features a star-studded cast including Academy Award winner Jeff Bridges (2009, Best Actor, Crazy Heart), three-time Academy Award nominee Joan Allen (1995, Best Supporting Actress, Nixon; 1996, Best Supporting Actress, The Crucible; 2000, Best Actress, The Contender), Academy Award winner Martin Landau(1994, Best Supporting Actor, Ed Wood), Academy Award nominee Frederic Forrest(1979, Best Supporting Actor, The Rose), Academy Award® nominee Mako (1966, Best Supporting Actor, The Sand Pebbles), Academy Award nominee Dean Stockwell(1988, Best Supporting Actor, Married to the Mob), and Golden Globe winner Christian Slater (2016, Best Supporting Actor – Series, Miniseries or Television Film, “Mr. Robot”). Experience four times the resolution of Full HD with Digital 4K UHD along with Dolby Vision™ HDR to bring to life the stunning cinematography of this beloved biopic. Dolby Vision transforms TV experiences in the home by delivering greater brightness and contrast, as well as a fuller palette of rich colors. Jeff Bridges gives a dazzling performance as Preston Tucker, a dynamic automotive visionary determined to create the car of the future. Against all odds, Tucker builds the Tucker Torpedo, and the better, safer and more beautiful his car becomes the more opposition stiffens until his factory is shut down by Detroit’s Big Three auto manufacturers. Tucker must fight for his American Dream in this passion-project film from Academy Award®-winning director Francis Ford Coppola (1974, Best Director, The Godfather Part II). Written by two-time Academy Award® nominee Arnold Schulman (1963, Best Writing, Love with the Proper Stranger; 1969, Best Writing, Goodbye, Columbus) and Academy Award® winner David Seidler (2010, Best Writing, The King’s Speech), and with cinematography by Academy Award® winner Vittorio Storaro (1979, Best Cinematographer, Apocalypse Now), the Tucker: The Man and His DreamBlu-ray + Digital and Digital 4K Ultra HD releases have extensive behind-the-scenes special features including brand new audio commentary by Coppola, an introduction by Coppola, a never-before-seen deleted scene exclusive to the home entertainment release, a featurette looking at the making of the film, and more. 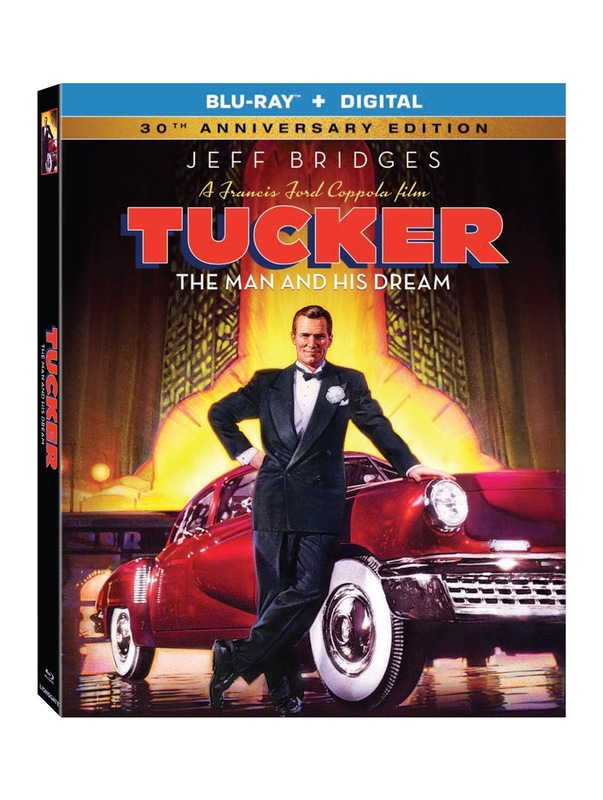 Tucker: The Man and His Dream will be available on Blu-ray + Digital for $14.99 SRP. The film has also been selected to screen at this year’s illustrious Il Cinema Ritrovato Film Festival in Bologna on June 29 with a special video message from Coppola and an introduction by American Zoetrope film archivist James Mockoski. Title Copyright: Tucker © 1988 Lucasfilm LLC. All Rights Reserved. Artwork & Supplementary Materials © 2018 Lions Gate Entertainment Inc. All Rights Reserved.